..not in the same glass I presume, but you never know. Might start a new trend. That's the moniker of a new bar planning to set up in Resolution Way, which looks like it could soon become the golden (quarter) mile of Deptford pub crawling if this trend continues. Gin & Beer (https://twitter.com/GinandBeerltd) is setting up shop in number 2 arch, right next door to Buster Mantis, and will apparently specialise in Belgian beers ('all styles including Trappist, new wave craft, lambic and sours') and a huge variety of gins too - about a hundred different ones. That's quite a night out. There's still a way to go yet as they have only just applied for planning permission to convert the arch, but they have said in a News Shopper interview that they are planning to open in the next couple of months. I wonder if they are paying attention to the recent issues next door? The licensees of Buster Mantis were summoned to a hearing recently by the licensing committee, after ongoing problems with residents whose properties overlook Resolution Way. The bar is licensed until 2am at the weekends and residents complained about noise from music playing inside the bar, and the noise of customers leaving the bar in the early hours of the morning. Although the licensing committee did not decide to reduce the opening hours of the bar, Buster Mantis was ordered to install double glazing to the two units, as well as fitting a 'noise limiter' inside to try and reduce the nuisance caused to neighbours by the music. This is not going to help with the noise caused by customers leaving the bar in the early hours, which I imagine is amplified by the narrow street and tall buildings that run along both sides, and the impact of more boozers opening along here is only going to add to this. On the other hand, maybe the presence of more bars will enable multiple business owners to work together to minimise the impact by encouraging people to disperse quickly and quietly when they leave. 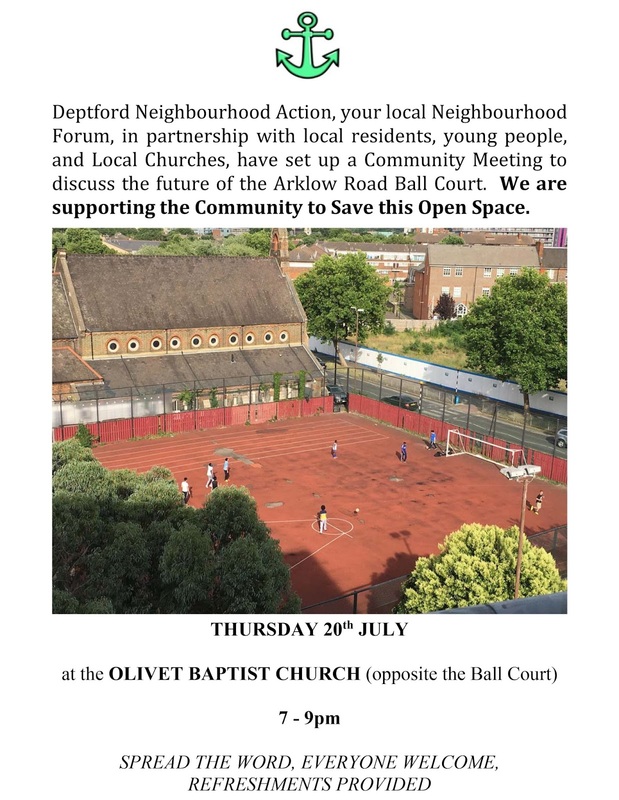 A community meeting is being held this Thursday for people who are interested in campaigning to save the ball court on Arklow Road. Lewisham Council recently announced plans to build a new development of temporary housing on the site, but some residents have raised concerns about the loss of play facilities in the area, and want the council to consider renovating it instead. The meeting is Thursday 20th July at 7pm at the Olivet Baptist Church, opposite the ball court. 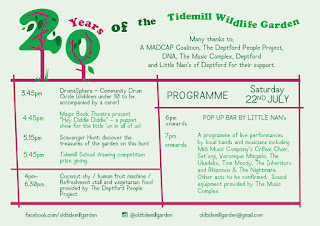 This weekend the Tidemill Wildlife Garden is celebrating its 20th anniversary with a family open day including games, story-telling, free veggie food provided by the Deptford People Project, a pop-up bar by Little Nan's and bands including The Ukadelix, Cre8ive Choir, Tom Moody, the Inheritors and Rhiannon & the Nightmare. 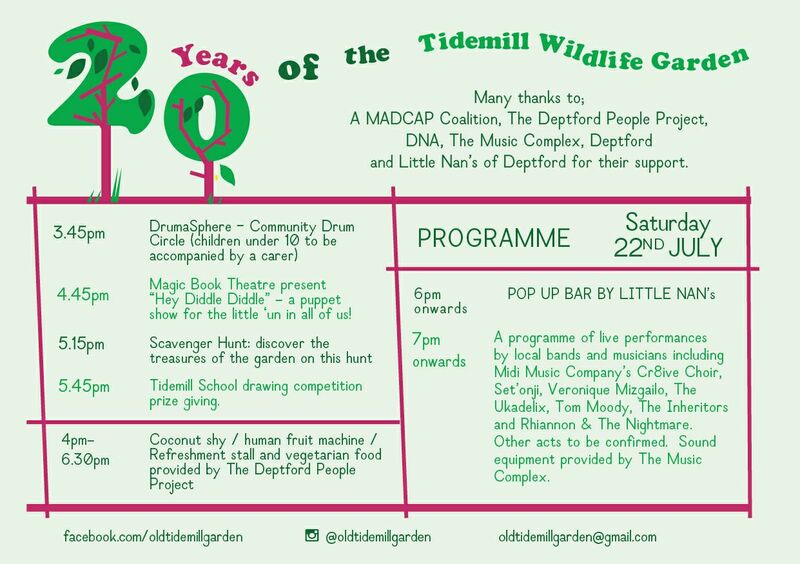 It takes place on Saturday 22nd July, running from 4pm till 11pm, and will include a community drum circle, a show by the Magic Book Theatre, a treasure hunt and coconut shy/human fruit machine. Sayes Court Garden CIC is fundraising on Spacehive to support its plans to establish a community and outdoor classroom in Sayes Court Park at the top of Grove Street. 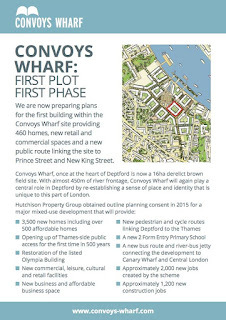 Once three times the size, Sayes Court will in time reclaim its lost land and leap the fence into the Convoys Wharf development, being one of two community-led projects that successfully lobbied for space on the site - the other being the Lenox Project. They say: "Before that happens, Sayes Court Park will be the community-led testing ground where we imagine and plan what that future will look like. Together we'll transform this neglected park into a source of pride for Deptford and a destination for London. This legacy is an invitation to test, grow and transform a part of the city, making better places to live. Through collaborative workshops, events and a reinstated pavilion, Sayes Court will become a centre for the community once again." The CIC is looking to raise £40k for a number of initiatives which are detailed on the Spacehive site. Pledges will only be taken if the project reaches its target, so if you want to support these ambitious plans, please pledge, share and help them to raise their profile. 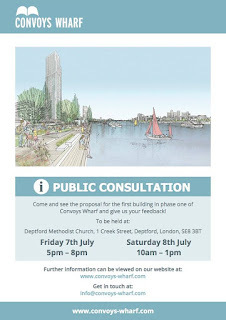 Convoys Wharf developer Hutchison Property Group has a public 'consultation' event today and tomorrow (Friday 7th and Saturday 8th July) at the Deptford Methodist Church on Creek Road. You are invited to attend and give your feedback on the plans for the first detailed planning application for the site, which relates to one plot in the first phase of the work (the one marked in red on the plan below). Outline planning permission for the site was granted in 2014 after the developer demanded that the mayor of London call the application in, saying that Lewisham planners were taking too long over it and that they were in a hurry to start work. Scroll forward three years... 'nuff said. 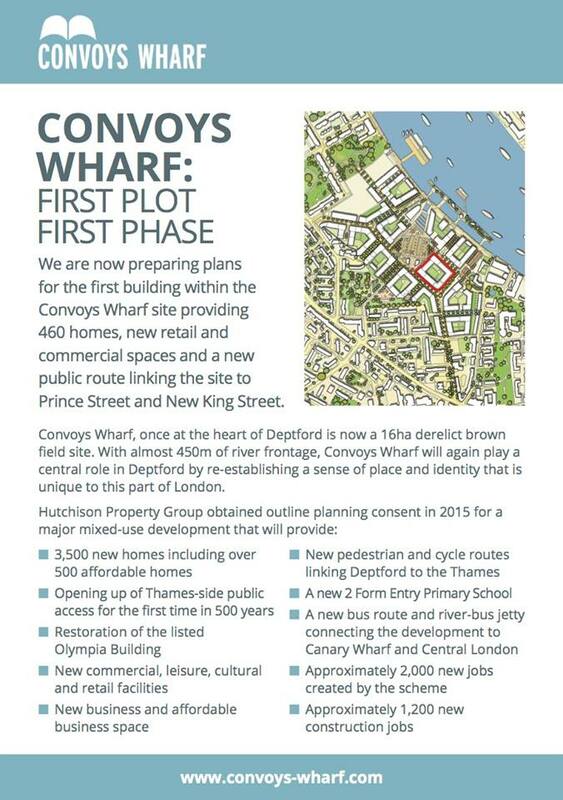 You can read my post about the outline application here and there's a lot more background on the development on this blog if you search for 'convoys'. The developer's rather woeful website is here. The consultation is at the methodist church on Creek Road (not Creek Street as the flyer says FFS) from 5-8pm tonight, and 10-1pm Saturday.